Ana Teresa was born in 1994, in Braga, Portugal. Started with 5 years old her musical studies in the Conservatorio de Musica Calouste Gulbenkian de Braga, after entry tests in viola, were she finished the 8th grade with distinction, having as a professor Dírio Alves. Played solo with in 2007 with the Conservatoire orchestra, and has performed in the most renown halls in Portugal as Casa da Música, Theatro Circo, Centro Cultural de Belém, Auditório de Congressos in Madeira, Museum Nogueira da Silva, Teatro Aveirense and Romantic Museum in Porto. And since she moved to London as performed in Amaryllis Fleming Concert Hall and also in some local churches as an orchestra player, chamber music or solo. In the years of 2008, 2009, 2011 and 2012 she integrated after national auditions the Youth Orchestra of Portugal National Music Conservatoires working with conductors as Nicholas Kok, Rui Massena, Eduardo Garcia-Barrios and Rodolfo Saglimbeni. In the orchestral area she also worked with António Baptista, Paulo Matos, Peter Stark, Martin André and Mark Messenger. In the years if 2011 and 2012 (leading) she participated in the 8th and 9th International Orchestra Course with artistic direction by Jean Sébastian-Béreau. Ana also made part of the London Mahler Orchestra in the year 2012 conducted by Daniel Capps. 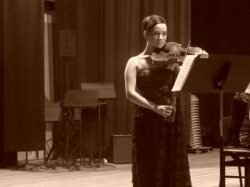 Ana has participated in many viola masterclasses, with professors as, David Lloyd, Anabela Chaves, Pedro Muñoz and Jean-Loup Lecomte. In competitions she won the 3rd Prize in A category of the 3rd Regional Competition of bow instruments and the 1st prize in the D category in the 2nd National Competition. In the year of 2008/2009 she won the Academic and Music merit Awards, and in the year of 2011/2012 she won the Music, Academic and Artistic (viola and singing) Merit Awards in her conservatoire. Ana also made the 3rd grade of piano with Francisco Fiúza, the 3rd grade of singing with Liliana Coelho and the 3rd grade of Harp with Eleonor Picas. Ana Teresa Alves is currently studying in the 1st year of Undergraduate in Royal College of Music, London with Ian Jewel. Ana Alves has been the assistant of her teacher in Braga Music Conservatoire, during two years, helping some tutoring some students. And she also gave private lessons to students in violin and piano beginner and viola in all levels in Portugal. I am happy to give all the help that I can in growing the person as a musician. I am very patient and friendly, I really like to teach and I've always had very good relationships with my students.